P!tux Linux was an operating system of the Linux family, based on Slackware Linux distribution and on kernel 2.2.x. It can be installed both on an ext2 filesystem (on a dedicated partition) or on a DOS filesystem (as a loopback device). It can be installed from DOS, Linux, in umsdos mode or via FTP. Basic installation requires a 486 PC with 8 MB RAM and 105 MB minimum hard disk space. During the installation another 150 MB will be used. 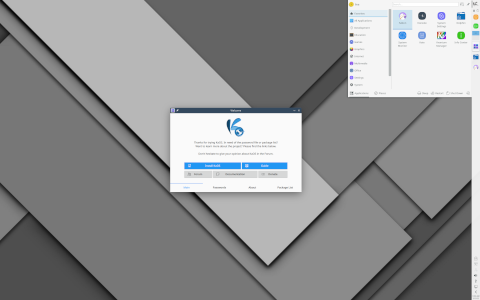 Rate this project KaOS is a rolling release, desktop Linux distribution that features the latest version of the KDE desktop environment. The project's newest snapshot, KaOS 2018.06, features KDE Plasma 5.13 and Croeso, a first-run wizard that helps customize the operating system. "Just days after Plasma 5.13.1 was announced can you already see it on this new release. Highlights of Plasma 5.13 include optimising startup and minimising memory usage, yielding faster time-to-desktop, better runtime performance, and less memory consumption. System Settings with KDE's Kirigami framework gives the pages a slick new look. KWin gained much-improved effects for blur and desktop switching. Wayland work continued, with the return of window rules, the use of high priority EGL Contexts, and initial support for screencasts and desktop sharing. And a tech preview of GTK global menu integration. This ISO has a complete redesign of the Midna theme for 2018. Some 2,500 new icons in use, rewritten SDDM login theme and a KaOS community selected new wallpaper (created by Jomada). Also new is KaOS' creation Croeso (Welsh for welcome) for helping with configuring a new install. It will run on the newly installed system and offers to adjust some 15 commonly used settings and replaces the formerly used, PyQt based first run wizard Kaptan." Further information can be found in the project's release announcement. Download (SHA256): KaOS-2018.06-x86_64.iso (1,880MB, signature, pkglist).